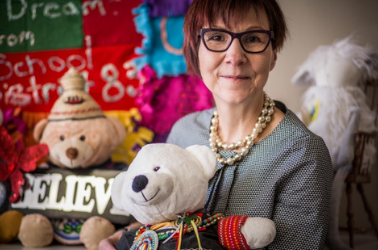 Advocate for Indigenous children's rights, Professor Cindy Blackstock shares the lessons she has learned and her hopes for the future. A tireless advocate for Indigenous children's rights, Professor Cindy Blackstock was recently named to Chatelaine magazine's Women of the Year list for 2018. Blackstock is a Professor at McGill's School of Social Work and the Executive Director of the First Nations Child and Family Caring Society of Canada. A member of Gitxsan community, she became a well-known activist in 2007 after filing a Human Rights complaint against the federal government for the systemic discrimination Indigenous children face in this country. Despite the judgment being in her favor, her battle for social justice and equality for Indigenous children has been a persistent challenge. In a recent interview, Professor Blackstock shared the lessons she has learned and her hopes for the future. What was the role of social work in your activism for Indigenous children’s rights? Social work didn’t come into the picture until quite late. I was born with a real sense of injustice. I have a responsibility that's been passed down from my family. I was taught that you must stand up in the face of injustice, no matter who it affects. It’s not just about standing up for yourself, for your friends and family. You have a bigger duty than that to the country and to the world. Role-models have played a big part for me. I had role models around me, Indigenous and non-Indigenous human rights activists, who were generous enough to tell me when I was going down the wrong path. There's no clear plan of how to address injustice. Sometimes you just start with a very firm basis of values, and then you take a step forward and do something without knowing how it will turn out. I always say to people, that's better than being silent and still. We know how that turns out—injustices of all scales are enabled by silence. I have an undergraduate degree in psychology and a master’s degree in management and law. In 2009, I worked towards my Ph.D. in social work. The field of social work has informed me through its principles of social justice. It aligns with the social justice I was brought up with, but it's also showed me that I need to improve my understanding of research, particularly quantitative research. That’s what drove me to social work. I question why social workers don’t focus more of their attention on social justice, especially when the world is growing intolerant towards a lot of different groups. There’s moral courage, but there’s also moral courage with dignity. Anyone can be courageous. It’s something different to take a stand in a way that uplifts the dignity of the people you are privileged to be working with. What I mean is it’s not enough to just be courageous. You must always act with dignity—it's your minimum requirement to match the dignity of those you work with. Being angry and frustrated won’t help. What are your hopes for the future, what change do you want to see happen? I would still like to see more social justice across all sectors of education, along with a set of tools and requirements to ensure progress is made respectfully and with dignity. I think no matter where you end up landing, there is going to be an opportunity to act with moral courage, and to act in the public's interest. Too often, people don’t feel they have the skills or the ability to do that, to act in the public's interest, and they remain quiet. I think in today’s world, where there are populist movements, and intolerance across race, culture, religion and gender lines, we need to equip ourselves to address these issues. No one ever feels ready. I was sure of only one thing when I started—that I was the wrong person to do this. I felt like I didn’t know enough. I was sure that I wasn’t smart enough, and that someone else out there was better equipped to tackle these injustices. You never feel ready. But I said to myself, “If I was experiencing this injustice, would I rather someone who doesn't feel ready try anyways? Or would I rather a person who doesn't feel ready just sit there and watch the injustice unfold?" The answer is, regardless of the outcome, I would rather a person do something—at least try. What’s the biggest lesson you’ve learned through your activism for Indigenous children? That you have to build a movement of justice on love. I think too many people base their movements off of anger or sadness. I’ve come to understand that the only way to defeat the darkness is with love and light. And that means everything we do at the Caring Society is peaceful. I built it this way so people of all ages and all incomes can contribute. We do this thing called Have a Heart Day. On Valentines Day, we ask children of all ages and adults to write Valentines to their elected official, so First Nations children can grow up safely, get a good education, be healthy and be proud of who they are. And they’re very honest saying things like, “I don’t understand why First Nations kids don’t get clean water.” But the wonderful thing about children is that they always sign their letters with love. You can tell the truth in loving ways. I think that’s something Mandela knew, that Martin Luther King, Rosa Parks and many other human rights activists around the world knew, including the March for Our Lives youth. They did the same thing.